It's no secret that lighting is important. A simple change to the colour or lighting direction can completely transform a render from looking sad, interesting, creepy or artistic. But that doesn't change the fact that lighting is really hard to do. When you finish a model you often end up dragging lamps around, not really sure if you're improving it or making it worse. And based on surveys done on BlenderGuru, I'm not alone in this. A few years ago I decided to find answers in photography. Because unlike us, photographers don't get any bonus points for a "realistic render", they have to rely on important fundamentals like lighting. I read photography books, attended photography courses, and even paid to visit a photographers studio, all to discover how they approach lighting. What I discovered was actually a relief! Photographers find lighting equally frustrating. Because there's not one light setup that works everytime. Each new subject requires a period of experimentation, trying out many lighting setups and styles until they find something that works. But for photographers, the most time consuming part of this process is in setting up and tweaking the physical lights, because even with assistants, it's tedious. And that got me thinking... as 3D artists we're working digitally. There's no reason we should have to manually move and tweak our lamps by hand like they do. Why not let the software do it for us? Instead of needing to setup lights yourself, this new collection of HDRs contain all the lights for you. So all you need to is add one to your scene and you've got instant lighting and reflections. But the real power is when you load in more than one, then cycle through them. This gives you the same experimental workflow that photographers use, minus the tedious manual labor. And you'd be amazed at how often the best style is the one you previously wouldn't have tried. The light setups aren't random either. 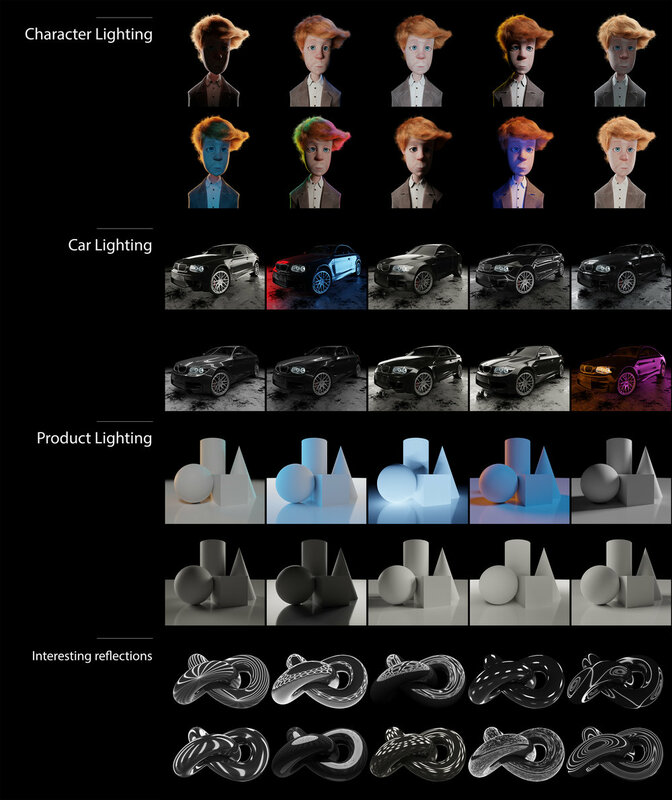 Each one is based off lighting from cinematographers, famous photographers and artists. And since Poliigon is all about realism, each of the lamps in the HDR was based off a real physical light source like a softbox or umbrella. So that if a light appears in a reflection it'll look real.